In the wake of the weekend slaying of University of South Carolina senior Samantha Josephson, some USC students are questioning the safety of Columbia’s popular Five Points area, the entertainment district frequented by college students late at night. Josephson, a 21-year-old from Robbinsville Township, New Jersey, was kidnapped and murdered early Friday morning after getting into a car she mistook for an Uber, a popular ride sharing service, just after 2 a.m. Her body was found by turkey hunters Friday afternoon in Clarendon County, about an hour southeast from the capital city. Columbia police, who had circulated a photo of the black Chevrolet Impala that Josephson had entered, arrested a suspect, Nathanial David Rowland, about 24 hours later in the Five Points area. Josephson’s blood was found in the car and trunk along with bleach and other cleaning agents. Her death has rocked the university community and called into question many safety procedures the university and Columbia Police Department have put into place to make university nightlife safe. “For the people saying, ‘this is her fault, she should’ve been more careful.’ Look, everybody should be more careful, but she wasn’t doing anything out of the norm from what most college students do when they come down here,” said Alex Waelde, who runs Drinking Ticket, a viral media aggregator that operates a popular Twitter account. Most Five Points bars close at 2 a.m., a new policy enforced by the city last year, but area employees say the crowds of bargoers flooding the streets make it hard to distinguish ride sharing cars from other cruising vehicles. “It’s basically a mass exodus of people and the streets are very crowded. If you get separated from someone I could see how it would be easy to lose someone,” said Ben Richardson, a freshman at USC and employee at Five Points bars Latitude 22 and the Moosehead Saloon. Richardson was working the door at Latitude 22 the night of Josephson’s kidnapping, but the bar closed at 1:00 a.m. due to low capacity. Uber and other ride services are supposed to drop off and pick up riders along a designated stretch of the heavily-policed Santee Avenue, outside of Jake’s Bar and Grill. But Richardson said he has yet to see drivers use the designated safety zone. On Monday, USC President Harris Pastides urged students to “embrace a new pledge… that you will NEVER use a ride sharing service without verifying the car’s license plate, make, model and color match the description listed on the Uber app. He also asked that every student or rider ask, “WHAT’S MY NAME?” before getting into the vehicle. “Asking “WHAT’S MY NAME?” must become as automatic for you as putting on a seatbelt in your own vehicle,” Pastides added. Columbia Police South Region Chief J.P. Williams said the number of uniform officers varies night-to-night. Richardson added he was not sure even an increased police presence could’ve prevented Josephson’s kidnapping. “I don’t know if the police could’ve stopped it, because there was nothing, like, out of the ordinary about what happened, at the time,” he said. USC junior Becca Murphy said she’ll see police presence in Five Points in a new light following the events of March 29. Pastides’ statement offered no information on policies or programs the university or police department plan to implement in Five Points, but did make a commitment to education. “I pledge to work here at Carolina, as well as with colleges and public health authorities across the nation to promote awareness of this pledge and to educate college students everywhere about their safety,” the statement read. Murphy said she welcomed Pastides’ efforts. “I think that’s a good start. I don’t really know how much the university can do,” she said. While both Richardson and Murphy don’t think this tragedy will deter students from flocking to the entertainment district, they agree that it will place a higher emphasis on caution and safety. “This was a random tragedy. It could have been anyone’s random tragedy,” Waelde said. Carolina News reporters Maggi Marshall and Mary Ramsey contributed to this report. 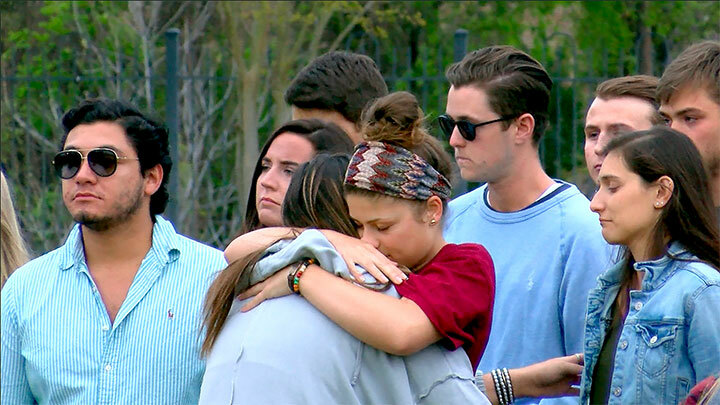 USC senior Samantha Josephson was kidnapped outside of the Bird Dog bar early Friday morning. Her body was found Friday afternoon in a turkey field around 3 p.m.